Keep the refrigerator and freezer doors closed as much as possible to maintain the cold temperature. The refrigerator will keep foods cold for 2-4 hours if it is unopened. Full freezers will hold the temperature for approximately 48 hours if the door remains closed. These times may vary depending on age of the unit, condition of the seals, temperature setting and amount of food. Before eating perishable refrigerated foods (milk, cheeses, eggs, meats, fish, or poultry) be sure tocheck their temperature. Foods that are 40º F or below can be eaten and are considered safe. Foods that are above 40º F for more than 2 hours must be discarded. Do Not Eat. Don't trust your sense of smell. Food may be unsafe even if it doesn't smell bad. Thawed food can usually be eaten if it is still 40ºF or re-frozen if it still contains ice crystals or is below 40ºF. You have to evaluate each food item separately. Partial thawing and refreezing may reduce the quality of some food, but the food will remain safe to eat. If the power is out for longer than 4 hours, use dry ice. 25 pounds of dry ice will keep a ten cubic foot freezer below freezing for 3-4 days. Handle dry ice with care and wear dry heavy gloves to avoid injury. Follow the golden rule of food safety, "When in Doubt, Throw it Out", for any foods which you are not sure have stayed at a safe temperature or which do not look or smell as they should. As I'm sitting here the wind is blowing and the wet, heavy snow is swirling around outside, making the potential for power outages a likelihood. 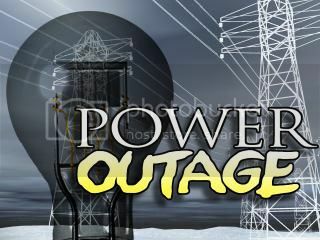 Thunderstorms and other inclement weather can also affect power outages. In the President’s plan to reduce gun violence the statistics related to school risk and emergency planning mirror the same needs as those of houses of worship. In May of this year DHS will work intentionally to address this sobering statistic for schools and houses of worship. The Department of Education, Justice, Health and Human Services will be releasing model, high-quality emergency management plans for schools, houses of worship, and institutions of higher education, along with best practices for developing these plans and training students and staff to follow them. In addition, the Department of Homeland Security, in coordination with the Department of Justice, will assist interested schools, houses of worship, and institutions of higher education in completing their own security assessments.